Sea Breeze - MADE IN USA. 100% Combed Cotton Solid Tee in delightful summer colors are great for everyday! Delightful 100% Combed Cotton Solid Color Tee that is perfect to wear everyday, with a comfort and fit you will never tire of. The solid colors in summer's hues will brighten and complete your outfit in a fun and cheerful way. All of your great features are accentuated in this Tee. Most ladies prefer to order UP for comfort due to the Moderate Women's sizes on S, M, L, XL. Check out the Size Guide below for actual garment measurements. 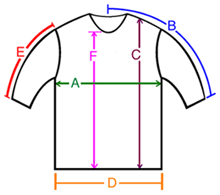 A: Chest / Bust circumference 35-36" 38-39" 39-40" 41-42"
B: Sleeve length from center of neck to end of sleeve 14" 15" 15.5" 16"
C: Body length from shoulder to bottom of hem 23" 23" 23" 23"
D: Hem circumference 33" 36" 38" 41"
E: Sleeve length from shoulder to end of sleeve 7" 7" 8" 8"
F: From the bottom of the V-Neck to hem 20" 20" 20" 20"
ordered the large. Everything fit perfectly, but the shoulder seam drooped a bit. I probably could have worn the medium too; it just would have been more fitted.